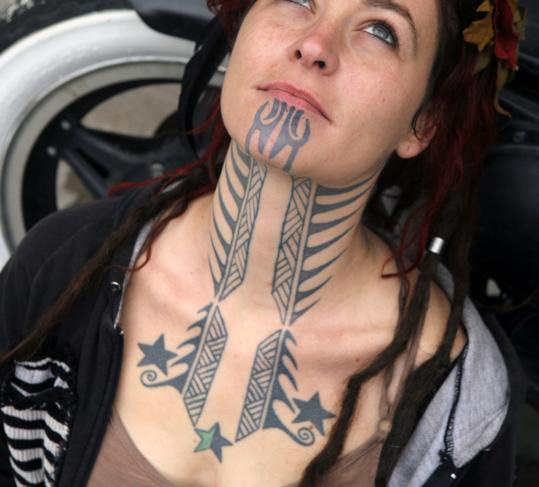 “The New Zealand Maori Moko is probably the most famous example of the warrior facial tattoos, but by no means the only one. Many European, and Native American tribes did much of the same thing, just not to the extent the Maori took the facial tattoo. Introducing Holly Brewer of the gypsy-punk band Humanwine who has decided to defy societal norms with a design covering her neck and chin that is more than a little reminiscent of the tattoos historically sported by the Maori. The tattoo began fourteen years ago – when Brewer was only sixteen – and has been completed over the years in friends’ living rooms and basements in Vermont and Oregon, since no licensed, reputable artists would perform it, especially on a 16-year-old girl. 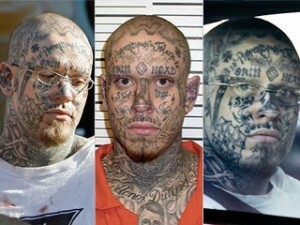 “Most tattoo studios will refuse to do those kinds of tattoos on the face, or antisocial ones. If you really want that kind of tattoo, you will have to go far and wide. … A lot of tattoo studios will be thinking down the road, you’re going to regret that,” Terisa Green, author of “Ink: The Not-Just-Skin-Deep Guide to Getting a Tattoo,” told ABC news. There’s no doubt that facial tattoos are still considered taboo and invite the stigma all tattoos used to enjoy before their induction into the mainstream. Facial tattoos, generally speaking, are associated with prison culture and make a bold, antisocial statement. Utah prison inmate Curtis Allgier is a prime example, with a face full of swastikas, the words “SKIN HEAD” etched permanently across his forehead and countless other epithets of racist garbage. Brewer admits to being accosted by people demanding to know why she did it. “If people seem like they really can’t handle it,” she said, “I’ll say it’s henna” – a natural dye that stains the skin impermanently. Although her own mother thought the black ink that dribbles down her chin and down her neck “very feminine, like a permanent necklace,” her father couldn’t help but cringe.